NYFF '08 | Politics and Cantet on Opening Night; Film Criticism in Focus; and McQueen's "Hunger"
It’s hardly a surprise that the U.S. presidential race was a hot topic on Friday night as the New York Film Festival kicked off in Manhattan with its traditional bash. With fewer than 40 days before the American general election, the opening night screening of Laurent Cantet‘s “The Class” took place at the same time as the first televised debate between Senators John McCain and Barack Obama. Heavy mist dampened the post-screening party at Tavern on the Green in Central Park where guests seemed torn between talking about the opening night film, winner of this year’s Palme d’Or in Cannes, and the evening’s debate. Reactions to both seemed about the same: somewhat mixed. Although enthusiasm for both the film and Barack Obama’s performance was considerable among those informally polled throughout the night – though the crowd were most likely not a typical cross-section of America’s political spectrum. The weather made for an especially crowded Tavern atrium, jammed with reserved round tables adornred with candelabras. Cantet worked the glass room with producers Caroline Benjo and Carole Scott, greeting well-wishers. Chatting with indieWIRE he saluted the kids in his new film, excited to be experiencing the gala event through their eyes and adding that he was particularly happy with the warmth that he, the kids and his film, were received on opening night. The movie was also greeted with positive critical notices on Friday. In the New York Times, Manohla Dargis praised it as artful and intelligent saying that the film is “as much an emotional experience as a head trip.” Reviewing the film for indieWIRE, Reverse Shot’s Leo Goldsmith honored the naturalism of “The Class” noting, “Cantet’s film renders the erratic whims of a roomful of teenagers in a manner that is as gripping in its drama as its image of reality is patient and vivid.” Both critics singled out the work of Francois Begaudeau, the former high school teacher, film critic, and author of the book upon which the movie is based, who also co-wrote the screenplay and stars in the movie. While the range of film criticism available from a variety of outlets is stronger than ever these days, the economics of criticism is gravely challenged, agreed a number panelists on Saturday afternoon at the New York Film Festival. One audience member declared that film criticism is in an intellectual heydey and no one seemed to dispute that. But, paralleling the situation on Wall St. and with U.S. banks, critics also seem to need an economic bailout to save some of the cornerstone publications that create and support international film writing. Or perhaps the role of the critic needs to change dramatically. Emmanuel Burdeau from Cahiers du cinema spoke rather ominously about the financial prospects for the venerable French journal. 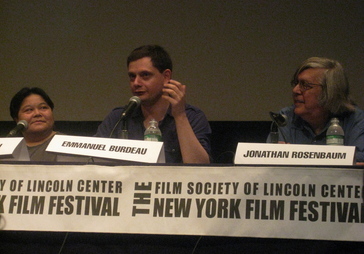 “This crisis is both economical and an editorial crisis at the same time,” he explained, detailing the losses incurred by his publication at a time with its readership is dwindling, advocating a militant shift, transforming film critics into film distributors who release and advocate for quality cinema, ensuring that the world’s best filmmakers have access to international audiences who now have more and more ways to see their films. During the discussion, particpants spoke often about fostering a broader community of connected critics and audiences, and the growing needs for critics to serve as curators for viewers. All of this can be facilitated through the modern interconnectedness of writers and moviegoers alike. “I started out as a film critic in New York, Paris and London and at that time you had to live in a city like that if you were going to learn about the history of cinema,” explained Jonathan Rosenbaum, former film critic for the Chicago Reader. “Today, you can learn about the history of the cinema anywhere in the world virtually. Some of the most sophisticated film venues exist in places like rural Argentina and some of the most sophisticated film viewers I know live in the middle of nowhere.” Prasing outlets such as panelist David Hudson‘s Greencine Daily, which offers a deep round-up of links to the latest international cinema news and reviews. Wisely, participants in Saturday’s Lincoln Center session abandoned talk of a tension between online and print criticism. “That’s an arguement that’s really finished, its over and done with,” Film Comment’s Gavin Smith noted at the start of the sessoin, “I feel we are all in it together.” Others on the dais included Jessica Winter from O magazine, Pascual Espiritu from Strictly Film School, Kent Jones from The Film Society of Lincoln Center and Film Comment, and Seung-hoon Jeong, formerly of the Korean weekly, Cine 21. Michael Fassbender in a scene from Steve McQueen’s “Hunger.” Image courtesy of the Film Society of Lincoln Center. “Hunger” dramatizes Sands’ story, in which he led the 1981 Irish hunger strike and participated in the “no wash protest,” whereby incarcerated Irish Republican members would be recognized as ‘political prisoners.’ The film follows events in Northern Ireland’s Maze prison in the six weeks prior to Sands’ death, including his rapid deterioration. The film took the Camera d’Or at this year’s Cannes Film Festival, and is making its Big Apple debut at this week’s New York Film Festival after exceptionally well-received screenings in Telluride and Toronto. At a press conference in New York this past Thursday, McQueen, a Turner Prize-winning visual artist who had spent years working with film and video based installations, discussed why he felt a move to the cinematic medium was essential to tell Sands’ story. One example of McQueen’s claim can certainly be suggested in the performance of Michael Fassbender, who plays Sands. Losing 35 pounds for the role, Fassbender’s remarkably inhabits the role physically and emotionally. Still, McQueen wasn’t initially sold on Fassbender. Get the latest coverage of the 2008 New York Film Festival in indieWIRE’s special New York section.